“Demi-gods in the White House and the administration are working systematically to undermine and dismantle LGBTQ rights," presidential hopeful Cory Booker said. President Donald Trump took a lot of hits at this year’s Human Rights Campaign dinner in Los Angeles. The advocacy group’s annual gala, at the downtown JW Marriott on Saturday night, celebrated the triumphs of the LGBTQ community and its stand-out allies. But much of the night’s talking points centered around the Trump administration’s negative impact on marginalized communities. Speakers, including Sen. Kamala Harris, Sen. Cory Booker and Yeardley Smith all took the stage and called on the audience to resist the White House’s discriminatory policies. “I am here to march with you, to rally together and vote to stop the relentless and systematic assault by the bigoted, vindictive administration that’s hell-bent on stripping us of all the progress that we have made, politically and humanly over the past 50 years,” said Smith, who took home the HRC National Leadership Award. Smith, who’s best known for voicing Lisa on “The Simpsons” has made significant contributions to the campaign over the years as an ally to the LGBTQ community. The Emmy-Award winning actress and activist was the single largest donor to the organization during their fight against Proposition 8 in 2010, which aimed to ban gay marriage. Christina Aguilera was supposed to accept the Ally for Equality Award alongside Smith but was a no-show. While accepting her award, Smith continued: “I’m here tonight as your ally to continue to faithfully stand by you as you live deliberately with dignity and courage despite, in many cases, tremendous personal loss when you declare who you are — fighting a fight that you never asked for." 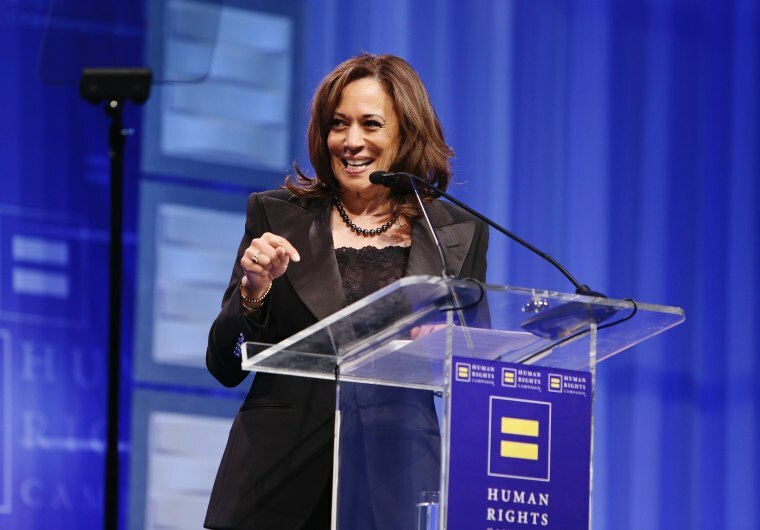 Presidential hopefuls Harris and Booker also took aim at the Trump administration in their speeches, both hinting at the upcoming 2020 election as a way to come closer to equality. Harris channeled her frustration with the White House on stage while speaking about “finding the truth” among all the political chaos of the last two years. Booker went on to acknowledge documents recently released from a New Mexico detention center at the border, which details the alleged abuse of LGBTQ immigrants. “We all have a collective responsibility not to take things as they are but to take responsibility for change,” he said. Off stage, gala attendees also spoke about Trump and his proposed ban on trans people serving in the military. “Will they please leave trans people alone? Let us live!” said Shea Diamond, a trans singer and activist, who also performed during the dinner. “You’re sitting in your white cis privilege, why aren’t you happy?” she continued, referring to those who voted in favor of the trans military ban.